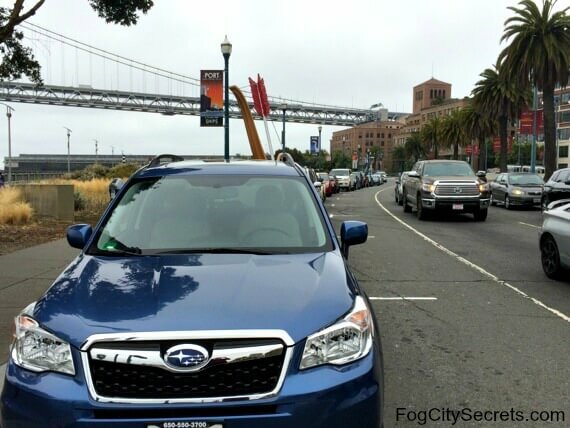 It's no fun trying to find a parking space along San Francisco's Embarcadero in heavy traffic! 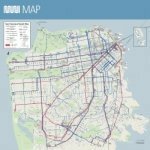 I've collected some Embarcadero parking tips so you can pick out some potential parking spots beforehand. I live here and park down here myself, so these can come in handy for visitors. This is the heart of San Francisco's tourist area, but you can actually park your car in this area without mortgaging your house, if you know where to look! 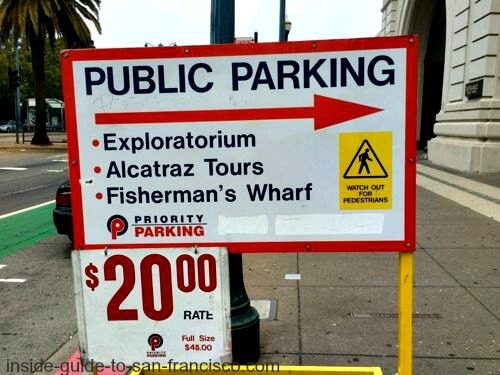 Also included are some suggestions for parking near Pier 33 for the Alcatraz tours. There is no parking at Alcatraz Landing itself, but there are plenty of choices nearby. 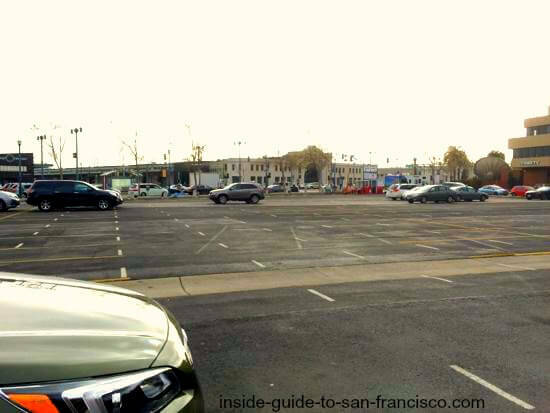 There is a large assortment of parking lots and parking garages spread out along the whole Embarcadero area; some are shockingly expensive, but others are relatively reasonable (by SF standards). These garages and lots charge a lot by the hour (typically $2 for each 15 minutes), so I've just given the day rates. Note: I may earn a small commission if you make a purchase through some of the links on this page, at no extra cost to you. This helps me provide all the free information I post on this website. All of these fees can change at any time, and sometimes there are good deals; you can compare prices of the garages in the area and find deals ahead of time with Spot Hero. Click on pins to see address, or zoom in. 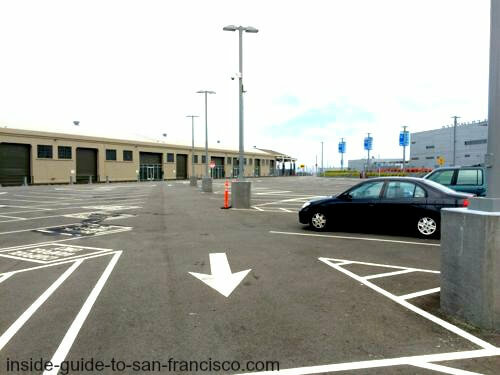 The huge (by SF standards) parking lot next to the cruise ship terminal doesn't seem to fill up much and the prices are reasonable, though they have just gone up a bit. $15 for first 2 hours. 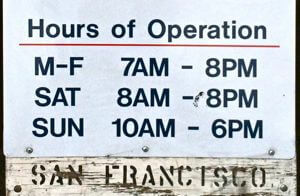 Open daily, 6 am to 11 pm (unless a cruise ship is scheduled - see below). I was there on a busy Thursday: arrived around 10:30, only two other cars there. When I left around 4:00, there was only one other car there. I'm sure there would be more cars on the weekend, but it's worth a look. Fees are paid via the parking machines via credit card, but there's an attendant/security present 11-2 weekdays and 8 hours on the weekends; don't forget to leave before 11:00 p.m. Tip: the attendant told me you always pay by machine here, never pay a person. They've had some crooks pretending to work there and collecting the fees from unsuspecting visitors! She also said they haven't had many problems with break-ins there (but still don't leave anything visible in the car). Also, cars must be out by 6 pm if a cruise ship is scheduled for the following day. This lot is on the Embarcadero, across the street from the Exploratorium. Very expensive ($35 daily), unless it's for a brief stay, though sometimes has deals on www.parkme.com. Early birds (before 9 a.m.) get a $20 flat rate. This is a huge lot; the entrance is at 1050 Front Street, which runs behind it. It doesn't mention this on the sign, but I parked there for a flat fee of $10 when I went to the Exploratorium on a Thursday evening in winter, and there were hardly any cars there. Also not on the sign, only $15 flat rate between 11:00 a.m. and 4:00 p.m.
Flat rate of $18, out before 6:00 p.m.; evening rate, $18 after 6:00 p.m.
$25 all day, $20 early birds before 10:00 a.m., $20 Sat and Sun. This is lot is very close to Pier 33 for Alcatraz departures, right across the street from the pier. The day rate is $35, but early birds before 8 a.m. get a $15 day rate (Monday through Friday only). $15 after 5 p.m., and $40 a day on weekends. Very convenient for Alcatraz and Pier 39, so it fills up. You can sometimes get good deals on this lot via SpotHero.com. 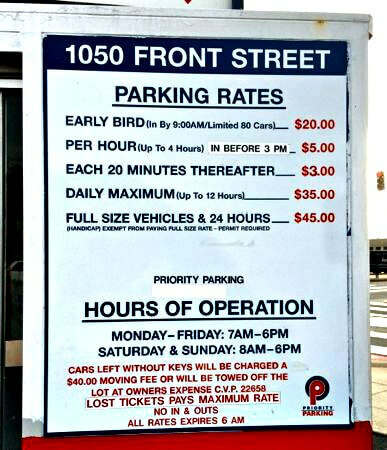 I got 8 hours of parking there for $8. Caveat: I used this lot for a night tour of Alcatraz. Even though the lot was well-lit and there were a lot of people around that area at night, one of the cars parked there had been broken into. The others had not been, so I don't know why that car was chosen. Definitely don't leave any items visible in your car when parking in SF...a sad reality. This pier has room inside for quite a few cars; it's bigger than it looks on the outside. Flat rate $20 per day (full size $48). This pier is right near the Ferry Building. 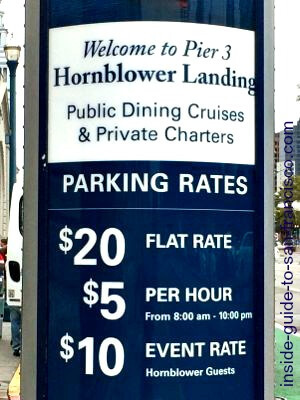 There is some parking inside the Hornblower pier, $20 flat fee, but somewhat more limited. It's only $10 for people doing a Hornblower evening cruise. Day rate $22, early birds before 9 a.m. and out by 7 p.m., $18. $16 day rate. One block from Pier 9. Monday through Friday, $18 day rate, and $14 for early birds before 9:30 and out by 7:00 p.m. 2 blocks from Pier 33, Alcatraz Landing. $18 day rate Monday through Friday, early birds before 9 a.m. $12, $25 Sat/Sun. Near Pier 39. This garage is $25 per day. This parking garage inside Pier 29 is $25/day and $30 on weekends. 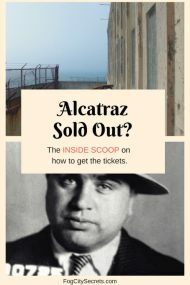 Even though it's very close to Alcatraz Landing, I don't recommend it for the price and because people have reported having their cars broken into there when it was supposed to be attended and wasn't. A recent visitor told me about the unpleasant experience he had there. He had reserved a spot online, but when he got there, there was no attendant or way to show he had already paid, so he ended up paying again to avoid a possible towing. He also said no one answers the phone at the number provided. The four Embarcadero Center Buildings that line up between Sacramento and Clay Streets have underground parking garages inside them. They are outrageously expensive without validation. There is validation for some of the businesses in the building, and for the Exploratorium and Ferry Plaza Farmer's Market, but it's really only a good deal if you're seeing a movie there (free for 4 hours), or visiting the Exploratorium on the weekend or evening ($10 flat rate), or the Farmer's Market for up to two hours on Saturday from 8-2 ($2 per hour for first 2 hours). Restaurant validation varies from $2 to $4 per hour. Check here for the current details for parking with or without validation in one of the four Embarcadero Center Buildings: Embarcadero Center Parking. Street parking is not pretty in this area of town. However, there are some possibilities along the Embarcadero between the Ferry Building and the Bay Bridge. Look for Cupid's bow and arrow; I've found places there. The parking meters charge $3.50 an hour. To check out what's available on the street in this area, see Spot Angels. There are now two companies offering special long-term parking deals for cruise ship passengers. 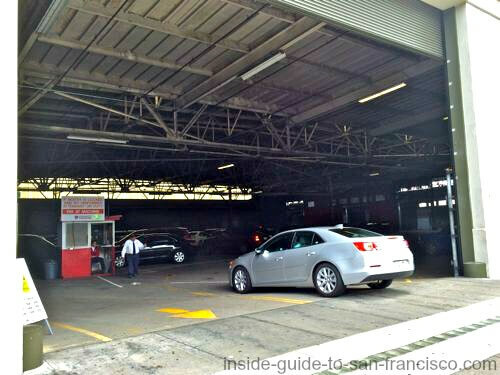 Impark has one garage with special parking arrangements for cruise ship passengers, located at 80 Francisco Street, quite close to Piers 35 and 27. The cruise passenger rate is $18 per day for secure, covered parking. More Impark info. Email them at cruiseparkingsf@impark.com, or call 415 578-0517 for reservations. Ace Parking also offers special cruise ship rates at their Anchorage Garage, at 500 Beach Street in Fisherman's Wharf. It's $15 a day for compact cars, $20 per day for full-size, vans, trucks and SUV's. About a 16 minute walk to Pier 35. Book online at Ace Parking. The Embarcadero is a popular spot for strolling and admiring the views. 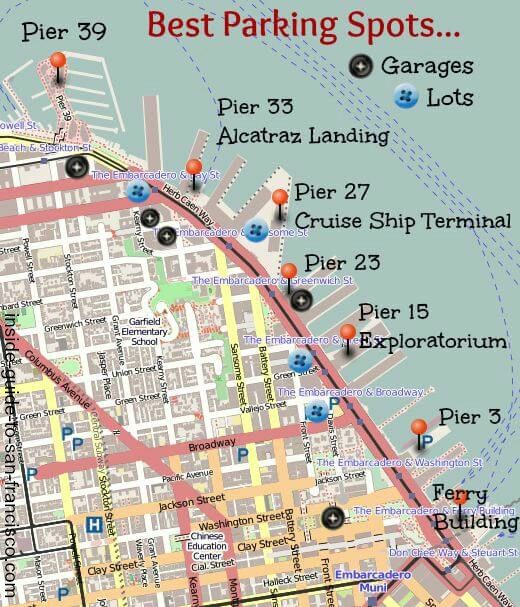 Some of the piers stretch out into the bay, the Alcatraz ferries leave from Pier 33, the Exploratorium is at Piers 15 & 17, the cruise ships dock at Pier 27, and the Ferry Building is at one end of the Embarcadero. For more info on what to see and do along here, see The Embarcadero. For a list of the San Francisco Piers and numbered maps, plus photos, see The SF Piers.